Late payments of rent and mortgage should be avoided. 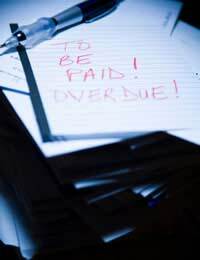 Regardless of who is legally responsible for these payments, or how the payments are actually made, the ramifications of consistent late or non-payments of rent and mortgage can be dire. When flatmate's live together and have each signed a rental agreement then they are known as joint tenants. This means that each flatmate has as much legal right to stay in the property as the other. This also means that each flatmate's has a legal responsibility to ensure that rent is paid and that it is paid on time and in the manner stipulated. The same holds true for two owners who are each listed on a deed. These owners are joint owners and are usually each responsible for ensuring that the mortgage is paid in full each month. If someone is living in the home without legal standing, (s)he is not usually legally liable for rent or mortgage payments. There are three main methods of paying the rent or mortgage: cash, cheque and direct debit. While it's unlikely that you'll be going to your mortgage provider each month with your lump sum amount all counted out in cash, but some landlords may still ask renters to pay in cash. If this is the case for you, try to make sure that your landlord issues you a receipt for cash payments be sure to keep a rent book or similar payment tracking method up to date at all times. Both mortgage and rent payments may be made by cheque. This is a great method for getting proof of your payment. Not only will you have the paper proof in the form of your cheque (and any carbon slips related to the cheque), but both the bank from which the payment is made and the account to which payment is made will have records as well. Finally, both mortgage and rent payments may be made by direct debit. Setting up a direct debit is relatively easy. Check with your bank for exact details, but for the most part you'll just need to specify the amount to be debited, where/to which account it should be sent, and on which date it will need to be sent. Once you have this on-going debit arranged you just need to check your account statements around that date to make sure that everything has been sent correctly. The easiest way to remember your due date for rent or mortgage payments is to make them on the same date every month. For example, remembering to pay on the 27th of the month is much easier than trying to keep track of paying on the last Thursday of the month. This holds true whether you are paying for the month previous or the month in advance. If you are paying in cash you will then want to remember to have your lump sum ready the day before this date, and if you are paying by cheque then you will want to remember to post your cheque at least one week in advance of this date. However, with a direct debit you will not need to remember as much as the money will be debited from your account whether you remember the specific date or not. Late rent and mortgage payments can put individuals into arrears which may require them to pay late fees or interest on their payments. Consistent late or non-payments of rent may lead to tenants being evicted and owners putting their home ownership in danger. Consult your rental agreement or mortgage terms to find out what will happen in your specific case in the event of late or non-payments. Questionnaire: How Much Should I Charge My Flatmate? Questionnaire: Are You Financially Compatible With Your Flatmate? Questionnaire: Do You Need an HMO Licence?